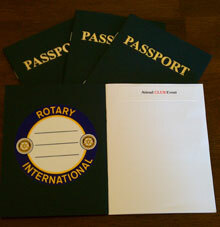 Misha Garafalo created passports for her club members to fill with “visa” stamps of their service activities. As a former Rotary Youth Exchange student to Sweden more than a quarter century ago, one of my fondest possessions is my beloved passport filled with sought-after stamps from countries I visited so long ago. Although I haven’t had the opportunity to travel internationally in many years, every now and again, I would come across the passport, flip through the pages, and reminisce about the sights, smells, and sounds which stirred my global awareness, curiosity, and perspective. When I became president of my club this year, the only African-American club president in Will County, Illinois, USA, I decided to incorporate the theme with my love of that impactful experience by creating Rotary-themed passports. At my installation ceremony, each member received a “Passport To Rotary.” The “visa” on the inside had to be signed by me and the member as an understanding of their commitment to care. Subsequent stamps would be provided to help them engage Rotary through specific activities and projects within the club, community, district, and beyond. At the end of my term, I will personally award Rotarians who have filled their passports with service and, hopefully, memories of how they changed lives. This entry was posted in Empowering youth and tagged Rotary Youth Exchange by Rotary International. Bookmark the permalink. We will actually have something on the website very soon; the Club had a very busy fundraising weekend at our community’s huge festival – Thanks for the interest and support! This is a wonderful idea of engaging Rotarians. Can you please send me a soft copy of the ideas and the passport. It is worth emulating. Please send an electronic copy of this passport. We would love to do something like this in Uganda. I commented when you first brought out this concept., but would like to ask if you are now in a position to let me have more details on how this works and to let me have a sample so that I can look at it and see if I can use it in my club. This is an awesome idea! Please are you willing to share a copy. I am just in the beginning of organizating a Rotaract club. We can use something like this. As President Elect for 2014 – 2015, I am already looking for ways and means to rejuvenate our club and this sounds a fantastic way of doing so. Would you mind sharing the idea with me and if so, could you let me have details of the passbook, etc. Great idea..I love a copy of the passport..much appreciated if you could mail a copy..
How can any of us get a “sample” Passport? At this time, we don’t have extra stock, but are discussing a way to reach out to those asking for samples – Thanks! and New tool for Retention and converting Members of Rotary Club into True Rotarians. Can you mail me a copy of the Passport. We actually received a lot of requests for samples, and didn’t have extra stock, but are in the process of obtaining more. Its something really wonderful idea to implement all around. If possible, please send me the soft copy of this idea in detail on . we Rotaractors from RID 3292, Nepal & Bhutan can implement this thing in our district after a small talk! The Club is actually working on formalizing the idea for others, and will try our best to release something on our website soon (www.rotaryclubofshorewood.org) – Thanks and be well! it is an awesome initiative! How nice to “rope” in members to become participating Rotarians – an effort that can be emulated. I wish I have a copy of the “Passport”. Can I have one? Could you post template of the passport on your club’s website or via social media? It’s a very creative idea that I will share with my Rotaract Club, thank you for sharing.